Up, up and away in my beautiful, my beautiful ballooooooon! Well, hopefully your trip will be a nice and happy time like that song suggests it will be. You certainly don't want to go all Hindenburg. Dirigibles play a pretty big role in a lot of Steampunk settings, but do you know how much trouble it is to keep one of those up in the air? 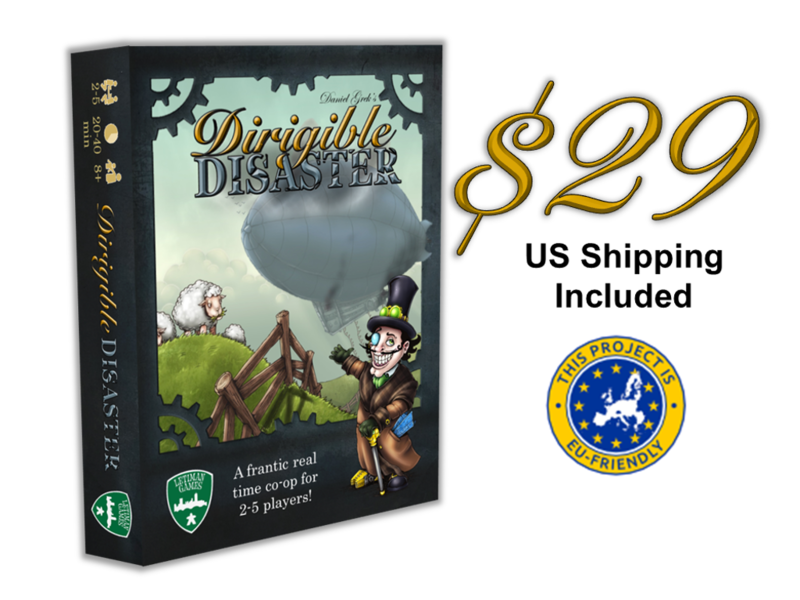 It ain't easy, and it's your job in Dirigible Disaster, a new cooperative board game from Letiman Games that's up on Kickstarter now. In the game, players must work together in order to keep the passengers happy and the dirigible afloat. Various elements will be against them, as new problems creep up every round of this 10-round game. Oh, and you have the clock to worry about, too. Yeah, this is a real-time game. Each round lasts for a minute. So you have to be sure you're ready to go and are good at controlling what happens if you want to win. You're going to need good, quick problem-solving skills if you want to come out ahead. The campaign is running now and is about 3/4 funded with still 27 days left to go.